Sorry, you can only order up to 98 units of this product! LED LOG FIRE EFFECT - the bright LED illuminates your space and can be used independent of heat. Enjoy all the beauty of a real wood burner without the installation, maintenance and cost of a real fire. FREESTANDING & PORTABLE - Durable MDF frame surround with electric heater comes as a complete unit - mobile style with no installation required for hassle-free heating. TWO HEAT SETTINGS - create the perfect environment with 1000W and 2000W settings. Simple switch operation. 7-DAY TIMER - Similar to central heating, pre-set your heater over a 7-day period to come on and power off when you want it to - particularly useful for heating a room before you'll be entering. DIMENSIONS - 100cm (H) x 109cm (L) x 37cm (D). Weight: 45KG. Includes safety thermal cut-off device, protecting your fireplace in the event of overheating. This product is only suitable for well insulated spaces or occasional use. Manufacturer 2 Year Warranty Included. Give your home a cosy focal point with this attractive LED fireplace suite - no chimney required! Every living room looks more complete with a fireplace, but if you live in a modern house or flat or don't want the hassle of a coal fire, this fabulous electric fire and fire surround could be the perfect choice. This electric fireplace with complementary fire surround is the smart option. It requires no installation - simply plug in and switch on! The sleek black electric fire features a realistic LED âflame' action plus moulded âlogs' for a real fire look. 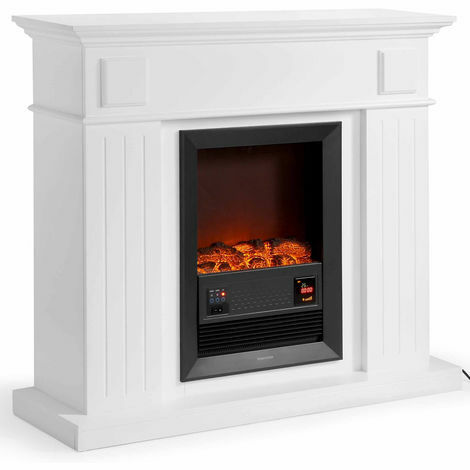 The fire has two settings: 1Kw and 2 Kw so you can choose the heat to suit your need. You can even run the flame light on its own if you'd like the comforting flicker, without the heat. The fire is set into a substantial fire surround, incorporating a mantel, which gives it great aesthetic appeal. The surround is made of MDF and finished in classic white - making it a neutral addition to any dÃ©cor.